Nick Lawson in Kids for The Spring Fling: Anniversary. 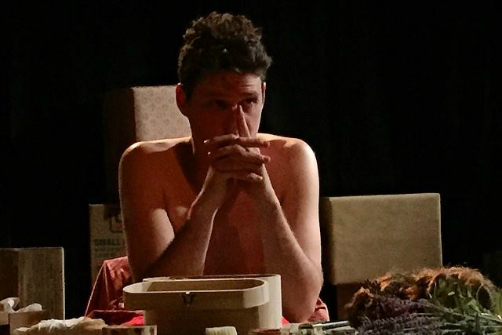 BOTTOM LINE: The F*It Club wows us again with another set of six new short plays. After presenting The Spring Fling for five years, producers Allyson Morgan and Mara Kassin still have a knack for gathering talented artists for an evening that exemplifies “art for art’s sake.” This year’s short play roundup features work by Jon Caren, Matthew-Lee Erlback, Elizabeth Irwin, Erica Saleh, Sarah Sander, and Daniel Talbott. Do not turn away just yet with images of inconsistent haphazard short play festivals – this one’s different. Not only are the plays thoughtful, but the production values coupled with clean, artistic scene transitions is an evening of theatre in its own right. Each Spring Fling revolves around a theme; this year’s is “anniversary.” Some took the literal approach such as Caren’s 8 And A Half Minutes Outside A Gelateria, about a couple who break up on their anniversary. We see how both characters grapple with whether to get back together or to move on. On the flip side is the abstract approach, such as Talbott’s Kids. In this play-meets-performance-art, two men struggle maintaining their affair when one of them is arranged to be married. We are shown fleeting moments with the lovers who try balancing what they want and what society expects. Actors Nick Lawson and Will Pullen are simply magnetic, even during the most gruesome moments. Unfortunately we have seen this story before. Erlbach’s Chippewa follows a debate amongst business partners of a defense contractor. A big contract has fallen through when Israel and Palestine sign a peace treaty, so now they must figure out which nations could potentially want a war next. The play’s concept is wildly clever, and its twisted comedy is only enhanced by convincing ensemble Nick Abeel, Aaron Costa Ganis, Mara Kassin, Topher Mikels, and Michael Schantz. Irwin’s On A Scale of One to Bey shows the teacher-principal relationship. Mara Kassin plays a brand new English teacher who has been left to figure out the ropes all by herself. But the principal, played by Rey Lucas, is too preoccupied with the upcoming school review to address her personal problems. Thus ensues a smartly written (and wonderfully performed) debate about the vicious cycle of how crumbling school systems fail to serve students. Sander’s December 28th is a beautifully sincere snapshot of a family remembering the anniversary of mom leaving home. The daughters, impeccably played by Heather Hollingsworth and Allyson Morgan, are trying to find ways of moving on. At the same time, the women try helping their father, performed by the expressive Larry Bull, move on, but he insists on clinging to the fruitless hope that his wife will return. My personal favorite play of the evening was Saleh’s To Ashley and Lauren. Molly Carden as Ellie and Keilly McQuail as Lucy are captivating as two close friends trying to balance celebrating Lucy’s birthday and commemorating the anniversary of their friends’ Ashley and Lauren’s untimely death. It is such an honest and realistic snapshot of life that I could almost believe I was with them. The bow on top of these wonderfully wrapped performances is musical performer Brian Quijada who provides the audience with bursts of live music between each play. Like any short play festival you are going to have your favorites and your not-so-much’s. But the entire team deserves a round of applause for developing thoughtful works and creatively weaving them together.